Born: September 24, 1922 in Boston Ma. 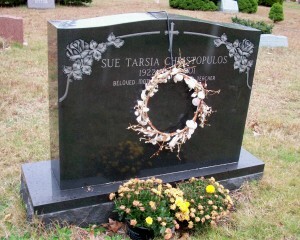 Died: September 2, 2001 in Osterville Ma. Married: February 20, 1949 in Boston Ma. To: Charles C. Christopulos; (1916 – 2003) (Christ C. Christopulos & Tasia C. Demeter); Charles is buried in Mass. National Cemetery in Bourne Ma.